Since 2003, I’ve said a year without New York is a year wasted. But after Boston or Bust, I managed to refrain from crossing the Mason-Dixon Line until this past August. We made up for it in grand fashion. 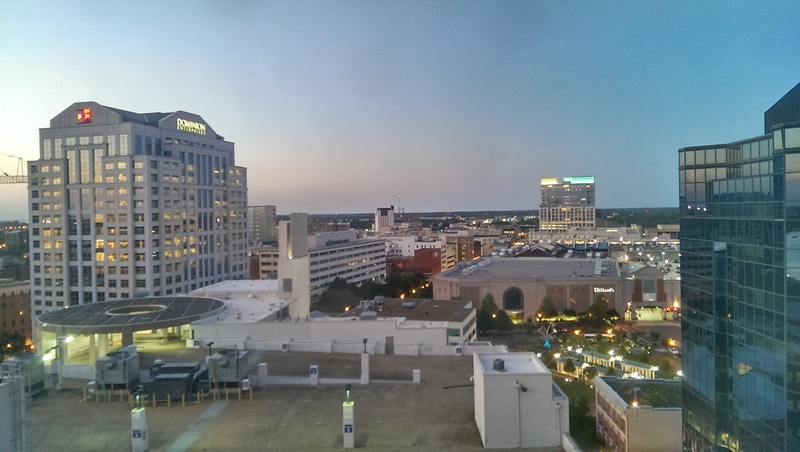 On Aug. 22, our voyage unexpectedly began in Richmond. I have two projects I’m working on there (both of which I can’t disclose at this juncture). After that informal business meeting, we crawled up U.S. 301, finally getting to Ravel Hotel after dark. I wanted to avoid driving across Manhattan and save some money on tolls, so I cut across Staten Island and went up the BQE to get there. The hotel was one of the precious few in Long Island City with a parking lot, but it was unavailable during the hotel’s renovations. I don’t leave my car any old place, but I’ve cone to trust leaving my car unattended in New York. Newark’s a different story. The hotel was pretty great, despite the work being done. We didn’t hear much noise, and the biggest inconvenience was the lack of a proper front door while the work was being done. I’d totally stay there again. What’s more, it had a rooftop restaurant, which is where I shot the photo above. 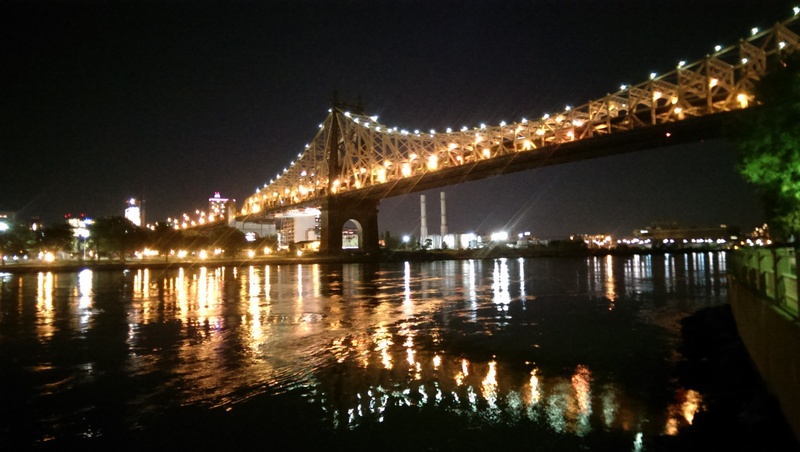 I brought a real camera with me and intended on having a day where I wandered around a took pictures, but instead, I took four shots worth sharing, three of which were of the Queensboro Bridge. After getting settled in, we headed to Cafeteria, which apparently is becoming our thing. Our thing used to be Spice, but this was one of the few times I was in New York and didn’t eat there. If Richmond’s Third Street diner had a younger sibling who stayed out of trouble, it would be Cafeteria. On Sunday, we had brunch on the roof and then went on a grand driving tour of Queens, the one borough of which I’d seen the least. Yes, I’d seen more of Staten Island. And the Bronx. The drive culminated in visiting Renée’s old neighborhood along the Queens-Nassau border. After that, I went to the Virginia alumni chapter meeting for my fraternity at a brother’s house in Park Slope. I haven’t talked about him in a while, so I’ll spare the introduction beyond saying he’s the type of person who would move to Park Slope and would be in the midst of moving back to Crown Heights when I arrived. Never mind that I was wearing cuffed jeans. And I have prescription Wayfarers. And almost all of the music I’ve shared on these entries. And the weekly typewriter posts. I got delayed trying to get to Manhattan — like a 45-minute ride turned into nearly 90, partially because I was directed to not walk all the way to the station at the tip of Prospect Park like Google Maps suggested — and I forgot to charge my phone while driving around Queens. I wound up being mad at the world and walked across the bridge to get back to the hotel instead of taking the subway. On Monday, we traversed Queens again, ending up at Roosevelt Field mall. Beyond that, the only thing of note we did was have dinner at Chef Yu. It might seem a little lame, but I’m glad we didn’t jam-pack the trip with stuff. We were outside the hotel mostly until after dark most days, and it made the trip seem longer, especially compared to last week. I had all intentions of writing this entry last week, but I blinked and it was Friday. After going to Westchester County to see White Plains, we were going to go to Rye Playland. This time, GPS was wrong, and we wound up in Connecticut. So we made a day of it in Stamford then drove around the Bronx. We then met up with my fraternity big brother, Ron, near his home in Bayside, Queens. This time, we had Italian at Papazzio. On Wednesday, we had our first day sans car and our most jam-packed day. We met one the former courts reporter for my paper at her new job in Union Square. We ate at Clarke’s Standard, which, for some reason, is on Broadway and doesn’t have an active website. Here’s a site on its design. It was great. After that, we wandered around downtown a bit, I got fancy tea from Palais des Thés then visited some museums. We began with El Museo del Barrio, which has a mission, according to its website “to present and preserve the art and culture of Puerto Ricans and all Latin Americans in the United States.” One of the exhibits was about the Young Lords and their actions. Afterward, we went where I’ve wanted to go ever since I found out about it by accident: The Cooper Hewitt, Smithsonian Design Museum. This is my favorite place in the entire world. I want to go here every time I spend more than two days in New York. I’m seriously considering becoming a patron in January. After that, we met with some of Renée’s friends and, afterward, got dinner at Dallas BBQ. It was big, gross, cheap and absolutely delicious. There are a lot of things on that menu I want to try, and I want to come completely starving. The following day was our last full day. We were pretty lazy at the beginning. After getting up way late, I wandered around with the suit I was wearing to a wedding that Saturday to find a cleaners. It was entirely too late to get it done in time. I meant to do that as soon as we got to New York. Instead, I got an obscenely large Cuban sandwich from a deli/Indian restaurant. I should have gotten Indian but 1) I really wanted a sandwich and 2) we were getting Indian for dinner. We got dinner with more of Renée’s friends at Bhatti Indian Grill and then I bought a blazer before doing another one of our things. 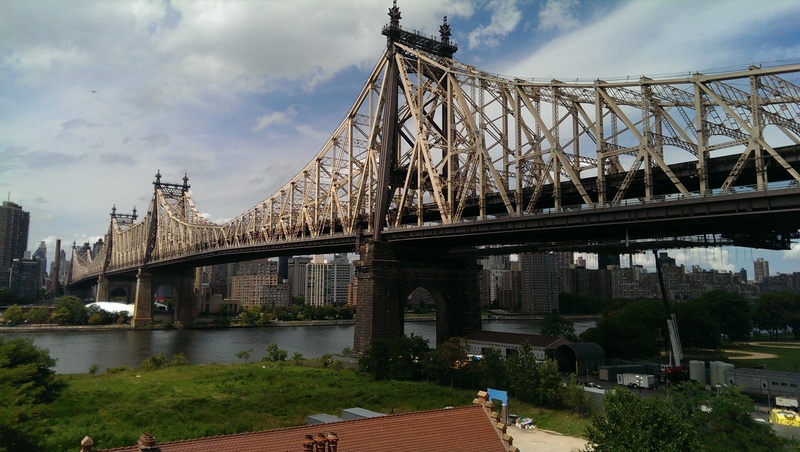 From Roosevelt Island. I really regret not keeping the camera on me. Since before we began dating again, Renée and I have had Roosevelt Island. 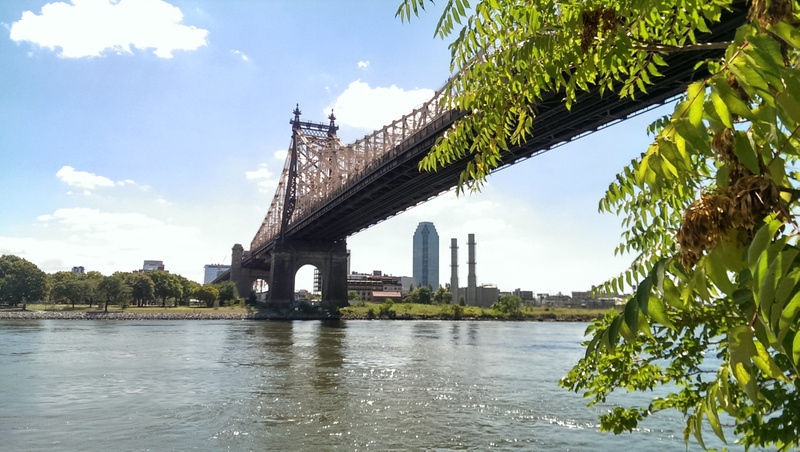 We’ll always have Roosevelt Island. We even have a semi-secret nickname for it. There’s just something about that silent, (relatively) bucolic island in the middle of the East River between Midtown and Long Island City. From there, we reluctantly headed to the hotel. It was time to bid adieu to New York. We had to return to Roosevelt Island before we left to make a quick pit stop. I got to take one last photo while we were there. Until next time, New York. And 59th Street Bridge. Once again, I was going to take a better shot, but I needed to feed the meter and Renée was more or less ready. Although that was the end of our New York trip, vacation wasn’t over quite yet. After being directed off the Bridge by Mentoria Hutchinson, and scowled at a few blocks later by another officer, we arrived at the wedding venue in Norfolk. I’m from Hampton Roads, and I’ve stayed at the Norfolk Waterside Marriott more times than I can remember. That night, we had dinner at Luce, because I’m noting every meal of note. Afterward was the wedding. It was joyous. It was boisterous. I took silly pictures in the photo booth that was set up. Sunday was the drive back to Charlottesville. I had a route planned across Virginia’s midsection. I took U.S. 460 through my haunts of Petersburg and Dinwiddie. I’d forgotten how large the county was and how I knew every inch in the era before GPS. We returned exhausted, but it was all worth it.I think it was why last week at work flew by. Speaking of last week, I drove down on Friday to see No BS! and then stumbled into Shaunelle’s birthday party. Afterward, I did the second leg of my mostly business trip from two weeks before. I’ll be able to tell you about all of it soon. I need to write something by the end of the week and then return to RVA either on the 14th, which really isn’t what I want to do, or the 23rd, which I really, really don’t want to do because it will be during the Richmond 2015 UCI Road World Championships. Well, if the latter happens, at least that could be another story to tell.